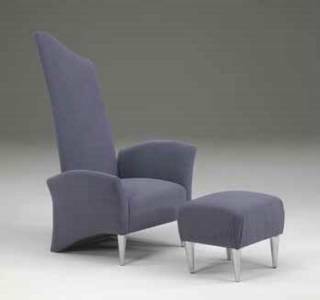 It's hard to miss the Eclipse chair from Carter Furniture, since the back is a towering 60 inches tall. This is not an everyday piece, but it would make quite the conversation starter in a grand entrance hall (with suitably tall ceilings) or at the head of a sizeable dining room table. I like the form of the Eclipse quite a bit, but not the comfort of it. Four words sum up my feelings here: Hard. As. A. Rock. A rock with a nice shape and a soft looking fabric covering, but a rock nonetheless. 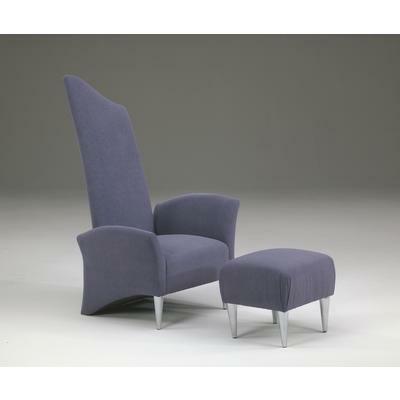 The uneven arms also work to the chair's disadvantage. Sometimes I find an asymmetrical piece of furniture gives me a chance to spread out in new and relaxing positions, but not on this giant. Instead I feel like I'm listing to port while simultaneously being keelhauled. I'm not a nautical expert, but those strike me as bad things, at least in furniture. Just because this chair isn't terribly comfortable, don't expect the price to be any lower. At the stores I've seen it in (Lee's Studio in New York, Kasala in Seattle to name two) it was running about $1,000.